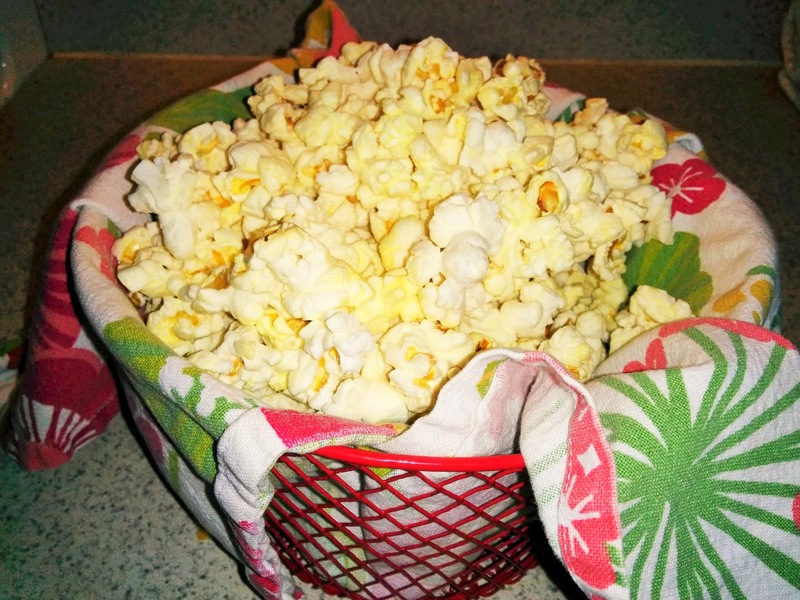 I love the ease of microwave popcorn, but don't like reaching into a greasy bag. We usually use big plastic bowls but they hog up all the room in the dishwasher. Lately I've been using baskets from Dollar Tree (just $1 each) lined with a cloth napkin instead of a huge bowl. The napkin gets tossed in the wash and the basket goes right back in the cabinet after a quick wipe. Thrifted baskets spray painted bright colors would work well if you don't have a Dollar Tree near you. When I was a kid mom always used wicker baskets lined with paper napkins. Of course she made popcorn in an air popper. I was thinking about trying an air popper, but the butter never used to get evenly distributed. Does anyone have a neat solution for nonhomogenous butter distribution issues? I'd love to hear about it. In the meantime, I'm stocking up to get ready to rewatch The Lego Movie. Everything is awesome!